Will Baillieu was commissioned by Geoff Ogden to design Merlin at the end of 1986. She is based on Ajax, but is 4ins deeper in the forefoot, and is finer in the stern quarters, with a sweeter transom. She is very much like “Surprise” in the deadrise, with straight lines from waterline to keel for more than half her length. This is to minimise wetted surface area and seems to allow a boat to climb to weather more easily. She was built by Tim Phillips, in Sorrento, out of Celery Top pine planking on Celery top ribs, with a Queensland Beech deck. After she was built, Will Baillieu rigged her and she sailed out of Portsea for 6 weeks or so, to trial the boat and rig. After a Couta Boat picnic at the South Channel Fort, 6 young girls were persuaded to strip off and pose on the deck of Merlin for a surprise photo to be sent to Geoff Ogden in Perth. Upon receipt of the photo he asked that the boat be immediately packed up and delivered to him in Perth! She has remained there ever since. She is a beautifully balanced boat, and in her trials at Portsea was more than a match for Ajax and Muriel in straight line speed. The deeper forefoot makes her a slightly drier boat than Ajax and does not seem to diminish her turning ability too much. She is an outstanding performer to windward. Geoff Ogden has the dubious distinction of having sailed Merlin under, in 2 capsizes on the Swan River, by over canvassing in the conditions. The first sinking was fortunately in reasonably shallow water, but the second time she went down nearly 90ft. Fortunately she was salvaged on both occasions, without more than superficial damage. This remains a lesson to all owners of Couta boats, about the vulnerability of open boats, and of the wisdom of sensibly reefing to the conditions. Geoff Ogden was the first of the Western Australians to dip into their pockets and obtain Couta Boats. He has been a strong supporter of the Club and has encouraged and persuaded others in WA to obtain boats, and there is now a strong and ever growing fleet in Perth. Merlin has been chosen over all other Western Australian boats to carry the Olympic flame across the Fremantle Fishing boat harbour, on its way to the Sydney Olympics. 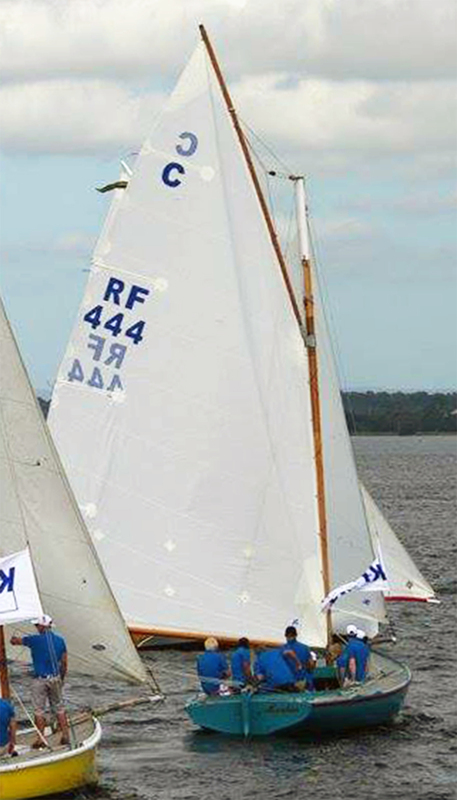 “A number of times I’ve sailed her in Perth and I must say she is a delight. Geoff, her owner, has sent her to the bottom of the Swan on at least two occasions and one of those occasions I believe was in 90 feet of water. She is always sailed very hard. No quarter given. About 2011 Geoff had her taken from Perth to Sorrento by his boatman boat man Carl and local man about Simon Tracy. Unfortunately the Land Cruiser had very soft back suspension and it was deemed, regretfully, that the wheels on the trailer be shifted forward to lighten the load on the vehicle. With disastrous consequences the trailer when approaching Eucla got the death rolls up and the trailer disconnected from the vehicle and the boat turned over a number of times completely wrecking it. I arranged for the boat to be delivered to Wooden Boatshop and she was a complete write off. Although she was technically uninsured because transit insurance had not been taken the insurance company under some duress came to the party and I believe they $70,000 insurance Sam was paid out. This of course was not enough to rebuild the boat which from memory cost $115 thousand. Consequently the owner was grumpy! The boat was subsequently repaired and the owner in enlisted a fully Western Australian crew to sail her in the Portsea Cup. Unfortunately that year the race was poorly managed with one of the last rounding boys drifting, the Merlin boys being right on to it were first to realize and ended up winning the race. But much to their agony and discontent the race was abandoned and of course the Victorians where the bad guys. My recollection is that they didn’t do the next weekend race but packed up and went home.